Now this is quite a different kind of war story. It's quieter, slower-paced, and more about three people's lives and how the war creates a 'before & after' for them, how it changes the trajectory of their lives. James is an English soldier, who is in a German POW camp. He survives the tedium and control, and random acts of violence, over five years by watching a family of Redstarts (birds) just outside the camp. His interest in birds and in logging his findings draws the attention of the Kommandant, who has a similar interest. Humphreys was inspired by the story of John Buxton, a birder with a similar war experience, but James is a clearly fictional character. She also used real life anecdotes a couple of more times in the book, in both of the women's stories. The women: James' young wife Rose, who married him in a rush as he was heading off to war. She is now drawn into an affair with another RAF officer, as she really has no strong feeling for James. This will shape the rest of her life. And Enid, James' sister -- a tough and independent Londoner who loses her home, job, and lover in a bomb raid, and comes to live with Rose. The two women clash both in their approach to life in general, and in their attachment to James. But they eventually come to a livable compromise and even form a bit of an unexpected friendship. And then James comes home. How do the three re-engage in everyday life after such a momentous experience? That is the key to this book. 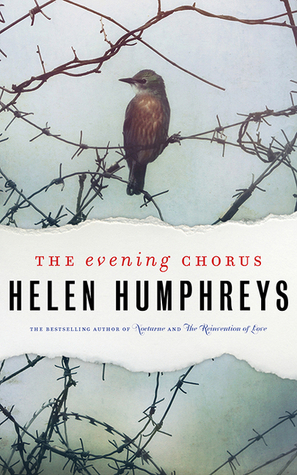 Humphreys doesn't examine the daily horrors of war so much as the effects on its survivors. It's a very quiet and still book despite the context of war. The writing is finely polished, with every phrase considered. The emotion in the story is often described rather than shown; the British habit of reserve is reflected in this choice. And the quiet sense of storytelling reaches into the conclusion, as well; I didn't feel that there was a big resolution, nobody suddenly solved everything and became proactive. Rather, they all just kept drifting along in the direction their actions had shifted them in. Even when those are relatively positive, ie: James writes a seminal book on Redstart behaviour, the characters don't seem all that excited by life anymore. I thought it was beautifully written, with nature's strength and beauty highlighted. But I did find that the bird metaphors sometimes leaned toward being a little bit obvious. And in the end, the quiet and measured pace of the book felt a bit dry to me. I wanted a little more of something, anything, to happen. So while I admire Humphreys' skill at taking a WWII story in a much different direction than found usually in this genre, I still prefer her earlier Coventry, for its more active protagonist and sense of immersion in the war years. I picked this one up on sale on Book Outlet last year. I'm sad to hear it's a bit of a slow mover, but I'll still give it a try for the writing. I'll give Coventry a try, too! Try it when you're in the mood for something contemplative & subdued - then you might find it just the thing! I found this one subdued even for her :) Will await your opinion.